With features including an SD card slot and an oversized display screen, the Wolverine Titan 8 in 1 is one of the best quality film to digital converters available on the market today. Boasting the largest display screen out of any other film converter, the Wolverine Titan is one of the easiest converters to view and edit all of your converted images. 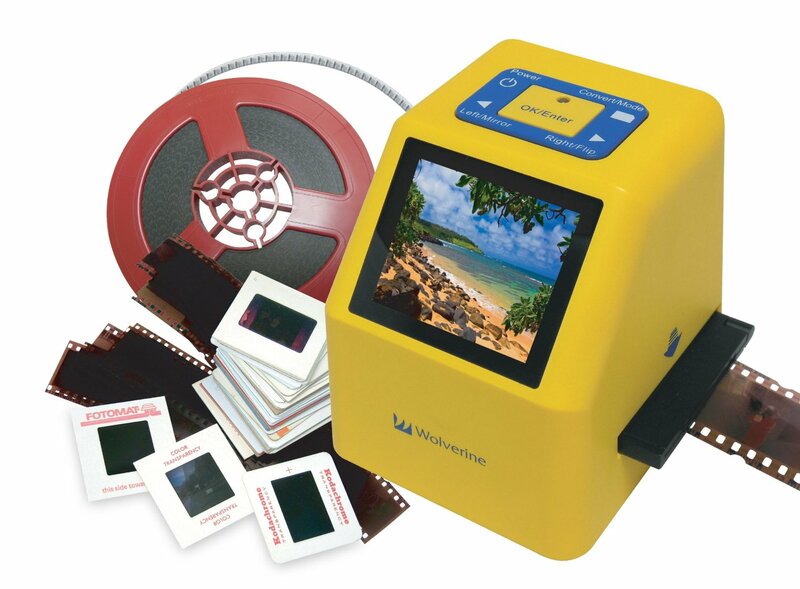 The Wolverine Titan 8 in 1 allows you to rapidly digitize all of your slides, 8mm movies and negatives in just seconds. 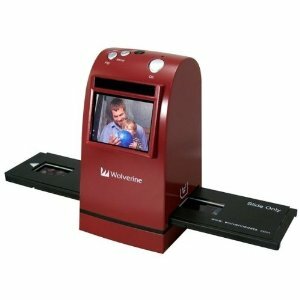 With the Wolverine Titan able to convert 35mm, 110, 126, 127, 8mm and Super 8 movies, as well as APS format films, this Wolverine scanner is able to help you scan and save all of the memories you’ve collected over the years. While it is not difficult to digitize your common slide and film formats, it is difficult to digitize certain types. That’s where the Wolverine Titan 8 in 1 steps in and sets itself apart from the rest. With features that include converting Super 8 film, as well as APS 110, 126, 127 and KPK negatives and slides. It then takes these images and converts them into 20 megapixels digital images in just seconds. The Wolverine Titan is essentially your one stop shop for all of your film to digital needs. Although it’s almost perfect for all of your digital converting needs, there is one downside. That downside is that the Wolverine Titan is unable to convert physically printed photos over to digital. So it won’t work with the printed photos in the shoeboxes under your bed. There is no doubt that image quality is everything when it comes to converting film and negatives over to digital. What is the point of converting something if you can’t make out what it is was converted over? That’s where the Wolverine Titan 8 in 1 comes into play and will definitely not disappoint. Having been maxed out with a 20MP sensor, which is higher than any other converter, it is able to deliver extremely high-resolution scans of up to 5472 x 3648 pixels in an astoundingly quick 3 seconds. Yes, you read that right. The Wolverine Titan was designed to convert over all of your film images into digital images that are 20 megapixels each in just a matter of seconds. Once the images are scanned, the Wolverine Titan then uses built-in software so that you can view and even improve your image’s quality. Using one of the largest screens available, a 4.3” color LCD screen, you are then able to go in and edit color balance and even tweak the brightness settings. So how is it that the Wolverine Titan 8 in 1 is able to convert the film to digital so quickly you ask? Well, the Wolverine Titan uses speed-load adapters that are dedicated to the individual formats of the slides or negatives that are being scanned. It then saves those images as JPEG files to an internal memory system or an optional SD or SDHC memory card. And if that wasn’t enough, users also have the option to connect directly to a computer (works and easily connects with both Mac and Windows PC) using a mini-USB port, or go directly to a TV with an HDMI cable. This digital converter was designed to be easy to use from the very beginning. Measuring just 4 x 5.5 x 3.5 inches and coming in at just half a pound, The Titan is portable, light and one of the smallest units available. But don’t let it’s small size fool you, the huge 4.3inch color LED screen is the largest available and allows for easy viewing of your new digital images and browse through the converter’s menu. Designed with ease of use in mind, it only takes a couple of minutes to setup, and with clearly labeled buttons and plastic frames that are extremely easy to use, you can start feeding film and slides into their slots located at the bottom of the converter. And not to worry, these slots are all marked accordingly as well. As if that wasn’t impressive enough, getting started couldn’t be easier. All that is required to get started converting your film images to digital is to simply push a button. No computer or other external software is required to get started. It is literally ready to go right out of the box. Simply plug it into any USB port or an AC outlet. Since the Titan is a standalone digital converter, it means that it does not need to be hooked into or connected to a computer to operate. But, in case you decide you want to hook it up to your computer or even your television, it can do that as well. Still need some more storage? Simply utilize the SD card slot where the converter can handle SD cards that go up to 32GB of storage capacity. In conclusion, the Wolverine Titan 8 in 1 is one of the best digital converters on the market today. 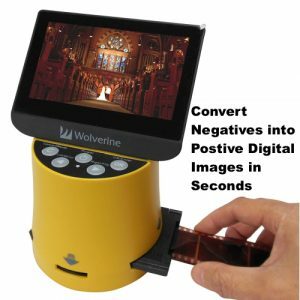 With features such as an extra large 4.3” color LCD screen, the ability to convert all different types of images including 35mm, 110, 126, 127, 8mm and Super 8 movies, as well as Aps format films, and the ability to hook up to a computer or television for even easier viewing, the Wolverine Titan 8 in 1 is a must-have for anyone looking to convert images over to digital. And with everything you need included so that you are able to get started as soon as you open the box, it really is a no-brainer.